Coming into the trading week, Finom Group outlined for subscribers its belief that a market bottom hadn’t been found as of yet and volatility would likely head higher before its inevitable decline. 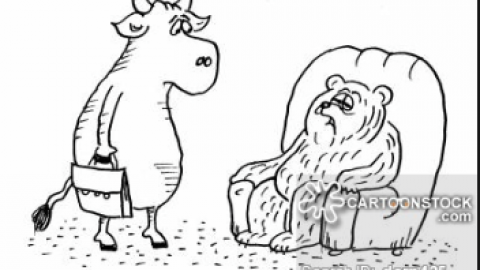 Monday investors found a deeply troubled equity market environment whereby the Dow was up more than 300 points at one point before turning negative by more than 500 points and finishing down some 245 points on the day. The Nasdaq (NDX) again was the worst performer of the session, with Amazon (AMZN) continuing its steep decline in share price and since it reported a miss on the top line in its Q3 2018 period. The S&P 500 (SPX) was the best of the worst performing indices on Monday, falling still by .66% or 17 points. The equity market U-turn seemed to coincide with a Bloomberg report that the U.S. is planning on slapping tariffs on more Chinese products if upcoming talks between President Donald Trump and Chinese President Xi Jinping falter. Both countries have already implemented levies on billions of dollars worth of each other’s goods. With these headlines on tariffs, President Trump also held an on-air interview for Fox News yesterday. The interview touched on a wide breadth of topics, but toward the end, President Trump discussed the trade war with China. He openly stated that he was optimistic a trade deal would get done between the 2 nations. 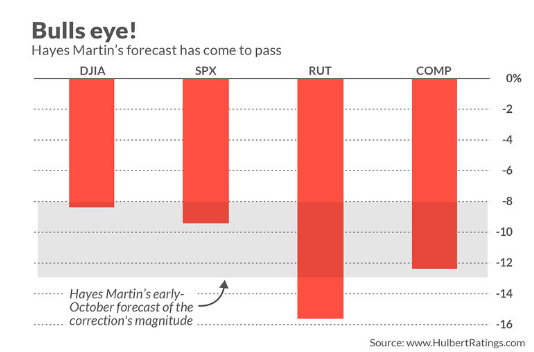 Wall Street analysts are mixed on what will become of the current market correction. 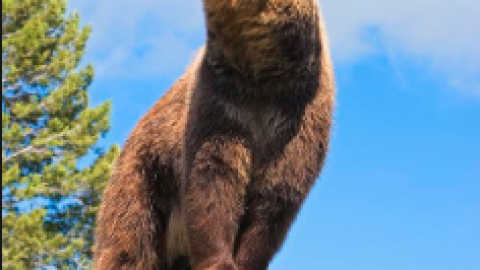 Morgan Stanley continues to beat its bear market drum and heralded its thesis with new commentary on Monday. In contrast to Morgan Stanley’s bear market thesis, Goldman Sachs also had its own take on the market environment and offered its outlook on Monday as well. 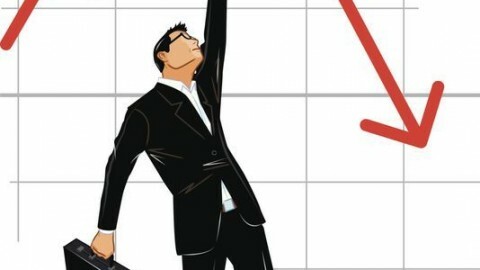 “The stock market sell-off over the past month has gotten “overdone” and will be offset in part as companies return to buying back their own shares, according to a Goldman Sachs U.S. chief market strategist David Kostin. 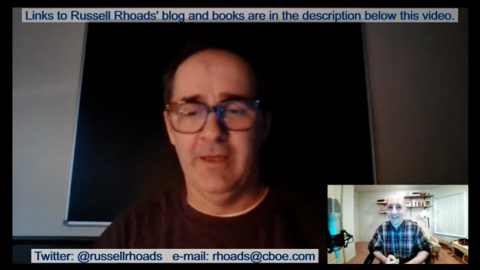 His analysis sees the market gaining close to 6 percent over the next two months. “The recent sell-off has priced too sharp of a near-term growth slowdown. We expect continued economic and earnings growth will support a rebound in the S&P 500. 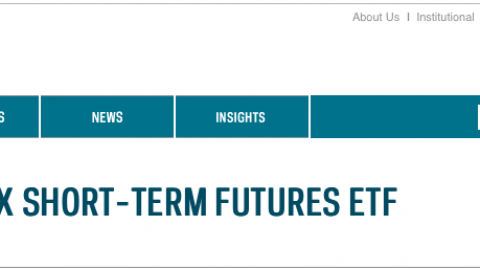 While Kostin has a more optimistic outlook for the market by year end than does Morgan Stanley’s Michael Wilson, investor are still plagued by uncertainty and a crosscurrent of strong economic data, rising rates and tariff concerns. Instead of the market having a sharp V-shaped bounce from a 10% correction, we’ve continued to see a slowly bleeding market. 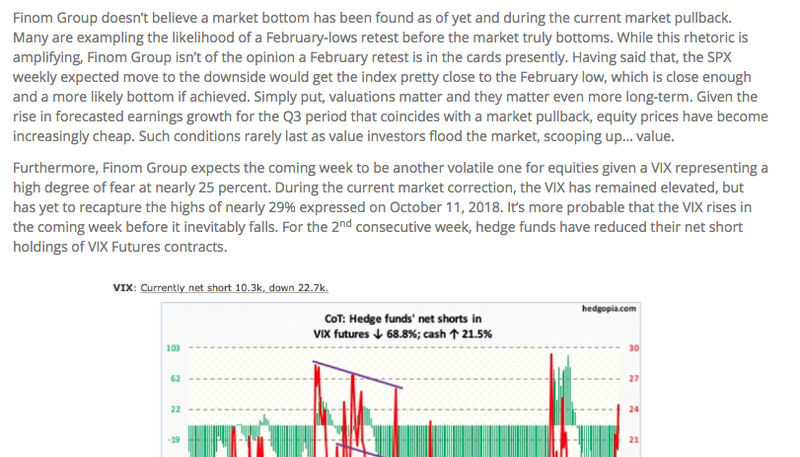 In many ways, the market sell off has been a rather orderly one, as indicated by the VIX which while elevated at roughly 25% is still not at levels seen during the correction in February of this year. In this market environment where rallies are being sold and good news is either bad news or found unworthy of buying activity, investors have been wise to hedge their portfolio market exposure. 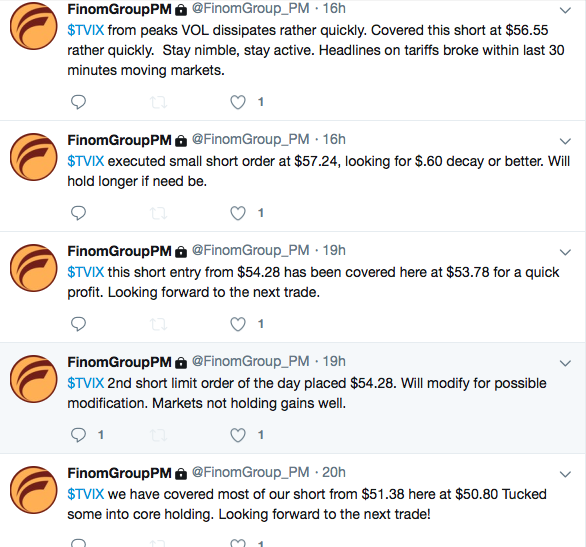 Finom Group also discussed hedging in our last research report for subscribers over the weekend. 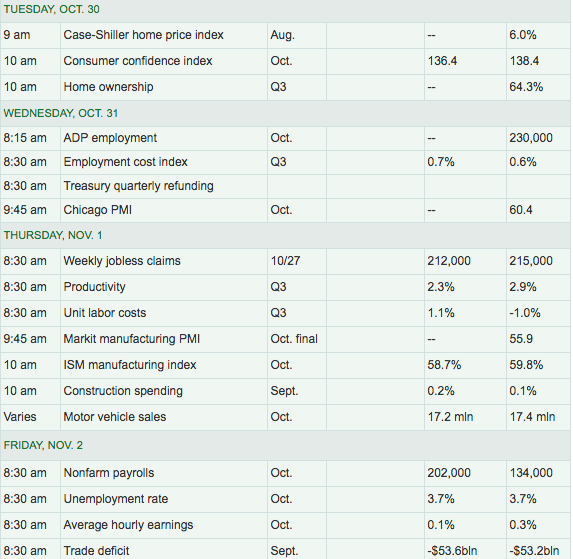 As noted previously, the market is shrugging off strong economic data and Monday was no different. 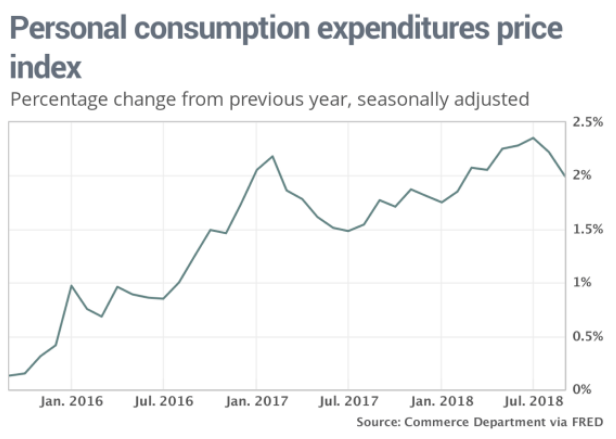 According to the latest read on Personal Consumption and Expenditures, the consumer spending component climbed 0.4%, the government said Monday. It was the seventh month in a row in which spending increased by that amount or greater. Incomes rose a smaller 0.2%, however. That was the smallest increase in 13 months. Inflationary pressures, meanwhile, appeared to have slackened a bit. While the PCE inflation index rose 0.1% in September, the 12-month rate slipped to 2% from 2.2 percent. The core rate of inflation moved up 0.2% in September, but the yearly rate was flat at 2% for the fifth month in a row. Americans spent more on new cars and trucks as well as recreational goods in September. They also shelled out more for health care. The increase in spending outstripped gains in income, possibly because of disruptions caused by Hurricane Florence. The biggest drop-off in income occurred among individual-owned businesses. The U.S. savings rate fell again to 6.2% from 6.4 percent. The savings rate has fallen all year from a two-year high of 7.4% in February, though it’s still relatively healthy. Finom Group has been forecasting a strong holiday shopping season to come, possibly one of the best in the last 8 years. The equity market may very well begin to price this in come November and post the mid-term elections whereby equities typical surge through the end of the year. 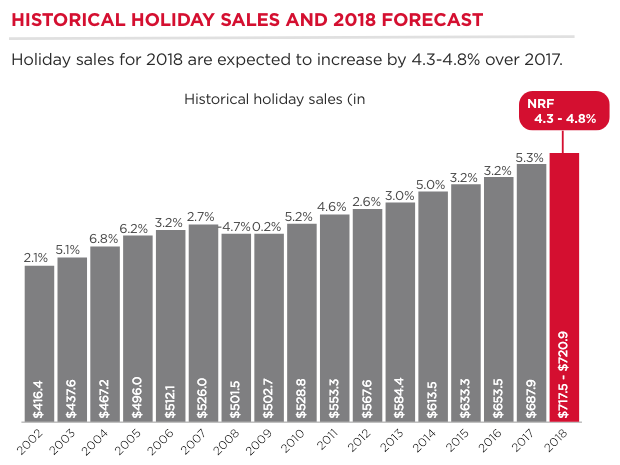 Finom Group expects 2018 Holiday retail sales to rise 5.4% YOY. 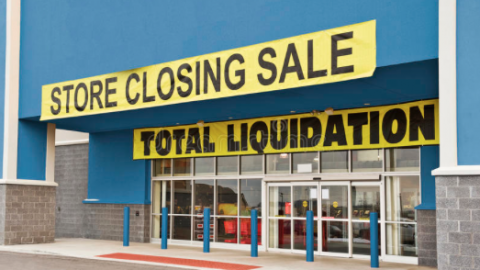 Finom Group’s outlook for Holiday retail sales is higher than that of the National Retail Federation. The National Retail Federation announced on October 3rd that it expects holiday retail sales in November and December, excluding automobiles, gasoline and restaurants, to increase between 4.3 and 4.8% over 2017 for a total of $717.45 billion to $720.89 billion. The forecast compares with an average annual increase of 3.9%over the past five years. Holiday sales in 2017 totaled $687.87 billion, a 5.3% increase over the year before and the largest increase since the 5.2% year-over-year gain seen in 2010 after the end of the Great Recession. 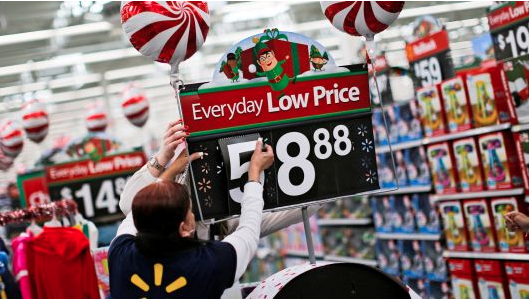 Retailers are also anticipating a very strong holiday retail season ahead. Wal-Mart (WMT) has been vamping their consumer shopping experience with easy checkout applications. The retailer said Tuesday it will be rolling out a “check out with me” option that it’s been testing to all of its stores by Black Friday. Starting at some locations as soon as this Thursday, shoppers will find Wal-Mart employees scattered throughout aisles with handheld devices that allow them to scan bulky items like flat-screen TVs and heavy furniture to allow customers to pay on the spot and have a receipt emailed to them. The devices aren’t intended to check out whole baskets full of items, but it will be capable of processing everything from groceries to apparel, Wal-Mart said. Wal-Mart isn’t the only retailer expecting a very strong Holiday shopping season, as Target (TGT) has also rolled out and announced a plethora of new and improved initiatives recently. 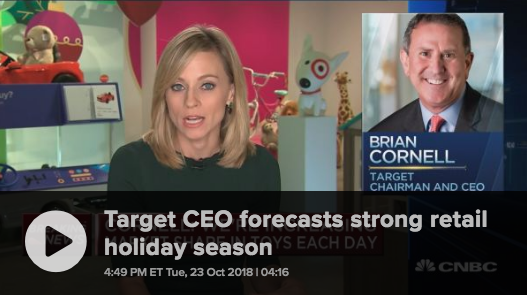 Here is what Target’s CEO Brian Cornell had to say about the retailer’s operation and the upcoming season last week in a CNBC interview. 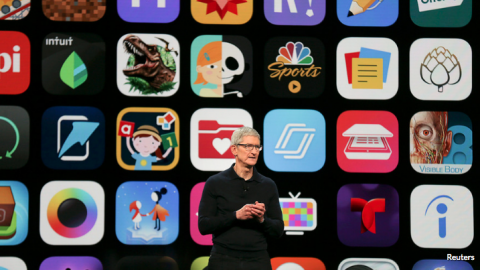 “We have made a major commitment to [toy] inventory to meet the demand we expect in stores,” Cornell said about the upcoming holiday shopping season. It has been a hectic trading week so far…and we are only one trading day into it. The biggest corporate earnings release for Tuesday won’t come until after the closing bell, when social media and digital advertising platform provider Facebook (FB) releases its Q3 2018 results. Facebook shares have plunged into bear market territory since last reporting results and is looking for a more optimistic reaction after disappointing investors 90 days ago. In terms of the economic data calendar, the remainder of the week has highly relevant tells on the strength or weakness of the economy. The big data series for the week will come in the way of employment and labor wage data. Nonfarm Payrolls will wrap up the data flow on Friday. As shown in the table above, economists expect a bounce back higher in the number of jobs created in the month of October, especially considering the number of seasonal job openings during the month coming available. Hayes is now predicting a rally between 10% and 14%. Such a rally would be enough to push the major market averages back above their all-time highs of earlier this fall. 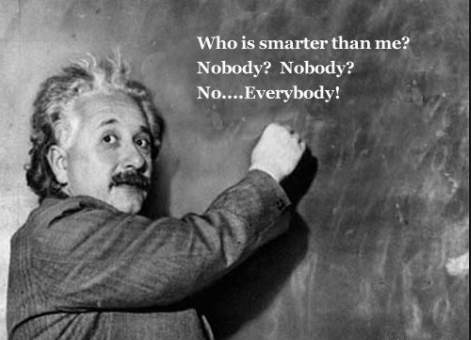 His principle thesis for the rally is akin to his thesis for the present correction, which he predicted. Today the divergences are bullish: As the major market averages such as the S&P 500 have been hitting and then testing new correction lows, fewer and fewer stocks have participated. 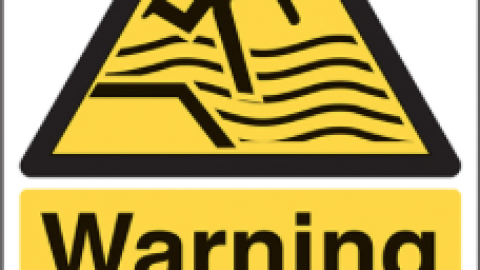 The other major reason Martin has turned bullish is that various measures of market sentiment point to extreme pessimism, which is bullish from a contrarian view. One of the indicators to which Martin pays particular attention to is the Inverse ETF Volume Ratio (IEVR), which measures the relative popularity of inverse ETFs. Such funds are the “easiest way for investors to play the downside,” and their volume therefore is a good measure of investor sentiment. Regardless of what the trading day brings, Finom Group will continue to look for trading opportunities to share with our subscribers. Yesterday’s whipsawing markets offered ample trading opportunities as shown in the 2 screenshots below. Subscribe today and take advantage of our large database of economic data and research reports. Trade with us and share your experiences with our various social applications on-site. Ending The Week With a Whimper and Below SPX 2,600?